User Ratings: 4.3/5 (244) Main Category: Support & Helpdesk Software Also Related To: IT Service Management (ITSM) Pricing: trial/premium Suitable for: Enterprises Native Applications: Web App iOS, Android Publisher: SysAid Technologies Ltd.
"SysAid is powerful Help Desk and IT Service Management software." SysAid scored 88/100 in the Support & Helpdesk category. This is based on user satisfaction (86/100), press buzz (46/100), recent user trends (rising), and other relevant information on SysAid gathered from around the web. SysAid is an IT support and management software solution. Designed as a digital help desk, you can use it for asset management and service request purposes. It can be used to maintain and support mobile and desktop programs. With an incident system and setup functionalities, the software helps you give quality support to your clients. The platform is a centralized IT management system covering several functions. You can notify clients with it, automate your help desk, monitor your performance data, and streamline your inventory. The product also helps you streamline and improve your company’s workflow to avoid and recover from incident problems. SysAid lets you create a ticketing system that you can monitor from the dashboard. Emails sent to different employee accounts automatically convert to tickets. You can also automate the dissemination process. Furthermore, these tickets come with various details such as a status alert, content category, and request time. 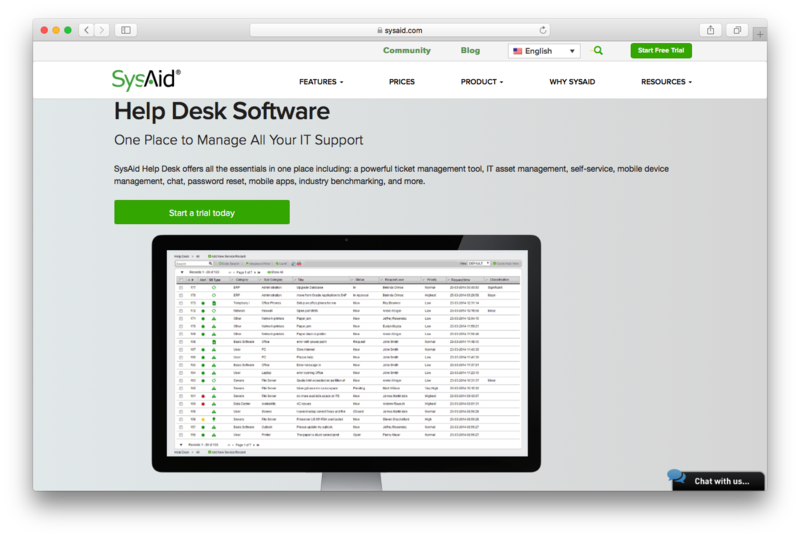 Your clients can use self-service portals to report incidents, request services from the help desk, and chat with the support team. A unique benefit a SysAid portal has is its ability to do automatic screenshots of the incident. SysAid can be accessed remotely. This lets you see another user’s screen and can integrate with third-party software like TeamViewer. Finally, Windows and Mac OS systems—like Windows 7, Windows 10, Sierra and Yosemite—are supported. 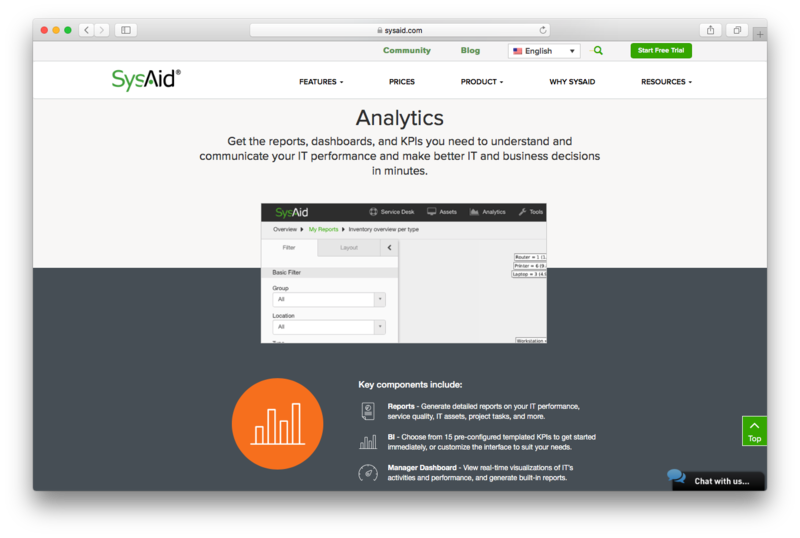 Once users send you incident reports, SysAid helps you by automatically organizing and highlighting them according to priority levels. You can then select which ones to tackle first. The program enables you to connect to your client’s computer and check their issue up close. Throughout the process, you can converse with them. This uninterrupted means of communications ensures customers get detailed instructions on how to go about helping you resolve their issues. When the problem is solved, the incident can be saved onto a database for future assessment. You can also link it to FAQs, ensuring customers and employees alike get ample information on how to quickly resolve an issue. You can also have the system notify you and your customers via dashboard or email. Change management is also available. System-generated workflows can be checked for system changes to review each step. You can then approve it and create other workflows via a built-in template system. You can also assign each part of the task to different employees depending on their specialty or role. You can redirect your clients to different assets to check on hardware or software to help them resolve incidents. Patches for different software issues can be downloaded to your customers. You can view each patch on the dashboard, which details their functions. You can then approve their deployment upon review. When downloaded by clients, the system can automatically send each patch individually or in multiple packages. When these products are disseminated to your clients, you can use a tracking system to check on each one. This can analyze the potential impact each file or hardware has on the client’s overall system. You can also use this to search for items that can improve their systems and suggest the assets to them. SysAid stands out thanks to its myriad automated and manual service options. You can have various processes such as email notifications and patching prepared beforehand to help your clients. If an issue proves to be a complicated affair, you can opt to remotely view their screens and guide them on how to resolve the problem. SysAid can be cloud-based or on-premise. It can be designed specifically for either a Managed Service Provider (MSP) or an Educational Center (EC). Each of the versions—cloud-based and on-premise—can be had upon availing of one of the three pricing plans provided by SysAid’s developers. These are the “Basic,” the “Full,” and the “A la Carte” deals. Customizable user interface – Modify the dashboard to highlight preferred notifications. Full UI customization – Change and edit different functions on the dashboard. The final edition is the “A La Carte.” Unlike previous versions, you can select which of the features mentioned can be added or upgraded from either the “Basic” or the “Full” plans. In this edition, you must purchase each desired feature individually. This is recommended if your company wants to fully personalize SysAid. It’s worth noting SysAid has a free, downloadable demo. It lasts 30 days. SysAid is an online automated IT support and management software solution. It has features for tracking incidents, making software changes, redirecting to asset catalogs, and sending email notifications. Key features in SysAid include the remote-control view of clients’ screens and the automatic screenshot of software incidents. This solution comes with a “Basic,” “Full,” and an “A La Carte” edition with various feature extensions and pricing by quote. 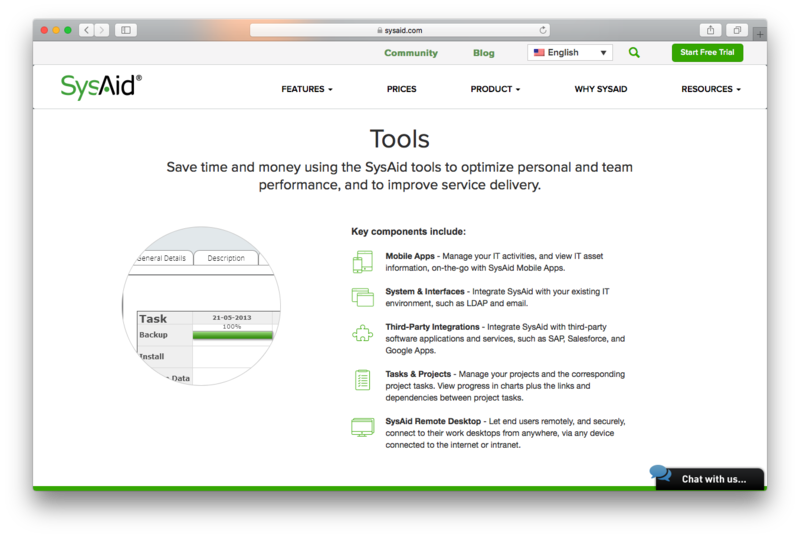 With its wide array of features, SysAid is a software product worth considering. Does SysAid offer an API? Does SysAid offer guides, tutorials and or customer support? Does SysAid integrate with any other apps? Does SysAid offer multi-user capability (e.g. teams)? What is SysAid generally used for? Who are the main user groups of SysAid? What platforms does SysAid support? SysAid was submitted by Ami Shimkin from SysAid Technologies Ltd.